Maneater is a Boss in Demon Souls. Twin demons who reside high above the Fool's Idol Archstone. 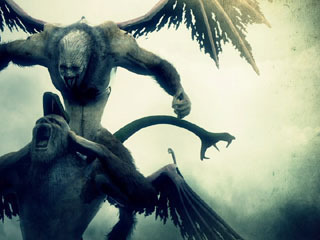 They are chimaera-like beasts in appearance, with the body of a beast, bat wings, a serpent in place of a tail, and a vaguely human head with luminous green eyes. Based upon speculation, they are products of the Old Monk's experiments on prisoners of Latria, as he attempted to create demons of his own. The Maneaters can scream sonic projectiles and are adept in melee combat. The serpent affixed to a Maneater's back can spew magic as a ranged attack, and at times, it will bite into the Maneater hosting it, thus imbuing the monster with magic energy. Meleeing the Maneaters requires strategy, skill and patience. For beginners the trick to successful meleeing is to separate the two Maneaters. If you try to melee both at the same time, you will be toast in no time. Even withWarding. Be careful not to fall or be knocked off the edge because it's very easy to. Cut off the tail first. Immediately upon entering the area, run past Maneater to the platform with a large brazier in the middle. This brazier will shield you from its melee and magic attacks. Most of them, anyway. It can and will hit you through it with its ground-based lunging attack, so be careful. You can dodge this reasonably easily, or just keep the central brazier (torch) between you and it. The brazier is very helpful in that you can attack almost through the edge of it with some weapons without exposing yourself as much as a direct attack would. The real fun comes when he spawns a second Maneater. The strategy only changes in that you should focus on burning down the one you've been damaging, because trying to split your damage will just lead to your death. Try not to get it so they will start double attacking you. Many players have died from repeated rushes by both Maneaters. Patience is key here. If they both land at the same time and charge the central area with the brazier, it's best to run down the stairs for a minute. This will usually cause one to fly away again so you can return to the relative safe-zone and continue wearing them down. Note that if you've already caught both Maneaters' attention, it may be to your advantage to try to avoid cutting off their tails. As long as one keeps moving, the Soul Arrow attacks are easily heard and avoided, and a Maneater with its tail cut off will be more eager to mob you and use its melee attacks, including the dreaded pounce. It's a matter of weighing your options: If you can reliably interrupt a Maneater as it starts power-boosting, you may prefer having to do that and dodge Soul Arrows now and then rather than run a greater risk of having two Maneaters attack you at the same time. Rolling around to dodge his attacks is asking for trouble. The biggest danger to your health is the environment, so play it safe and only dodge as a last resort. A decent shield and sensible stamina management will negate all of his physical attacks. If you want to make the fight easier just cast Warding. If he connects he will barely hurt you at all, even on NG+ and beyond. Note that this is a one-on-one strategy which assumes that you have taken out the first Maneater using the fog gate glitch. Pretty much the same thing as the shield strategy. Rolling will end badly if poorly done so try to block or dodge by running (not sprinting). When you see him get up and raising an arm simply walk back and when he punches the ground counter with a single swing. When you see him get down go to the side and if you can out of his way, since its the lunge attack. Try to keep your back turned to the fog or the brazier. In here if he lunges he will not fly away. Do the opposite if you need time to heal. When blocking his lunge (if you can't avoid) do it from a angle, not head on. A heavy weapon, Enchanted will allow you to make the most of his openings, as long as you don't get greedy. Try to go for the tail first to restrict his attacks. When he nears 20% health the second Maneater will spawn. You want the first one near you and have good stamina and your weapons Enchanted if applicable. Now use that Stamina and destroy the first one. As long as you don't let him fly away or get your self surrounded this boss should be easy. On NG+ this becomes harder and will require better timing and powerful weapons. Wear the Thief's Ring and enter the fog. Run (don't sprint) towards the first Maneater. Allow it to do an attack on you, especially the lunge/pounce or stomp. Dodge roll the attack. If it does not attack, attack it only once with a sword (or melee weapon of choice), this will cause it to do the pounce attack immediately. Expect the pounce and dodge accordingly. If you attack it twice you may not have the time to dodge. As soon as it pounces it's back is towards you. Sprint towards the central brazier, stand on the other side of the brazier and confirm it has lost you. Try to adjust the camera angle and find him. If you move too much, you will be spotted. As soon as you have confirmed he has lost track of you, run or sprint to the other fog gate and wait there for the second Maneater to spawn. Alternately you can try and sprint directly to the opposite fog gate (instead of checking around the brazier) and confirm it is not following you. This is a sure fire method that you will fight only one at a time. Trying to kill the first Maneater before the second one spawns is extremely difficult with melee and is not guaranteed, since they have a tendency to flyaway and stay in air for a long time. If you have followed the steps mentioned above the first Maneater should be stuck (lost) in the first half of the pathway while you wait near the other fog gate for the second Maneater to spawn. Don't worry the second Maneater has a tendency to spawn near you. There will be a sound and a second life bar appearing before he physically appears. If you have a good shield (Dark Silver Shield +5 for instance) and decent stamina (>100) you can block all its attacks. Bring a shield which blocks magic is useful, as his Soul Ray attack is magic based. Maneater will have his back to you normally after the pounce attack so use that time to regain the stamina instead of attacking ie if you block the pounce. Now the battle is between the second Maneater and you near the 3-3 fog area. You need to remain between the 3-3 fog area and the central brazier. Don't go too near the central brazier as you will alert the first Maneater. Hold your shield up and keep moving around the Maneater and backing away as needed. Be careful not to fall down. Moving around will lower the stamina drain caused by absorbing the damage with shield especially the two handed stomp attack. There is a pause after each attack so use that to gain stamina or attack the Maneater as needed. You can attack the Maneater after all his attacks. But don't get greedy as it cannot be stunned. Large, straight, asian swords are ideal. Using heavy weapons like Meat Cleaver, Dragon Bone Smasher will leave you open after the hit (during the recovery animation). The safest is to hit once with the most powerful sword you have (pure physical, magic, fire, whatever) and wait for him to react. Start improvising on the number of hits after you become confident. Even trying to hit it twice sometimes leads to eating the pounce attack. Normally he is open to two hits after the pounce attack but be ready to dodge/block after the second hit. You can hit him during the snake biting/paralysing animation also but again don't get greedy. He has a tendency to fly away randomly, that is your chance to heal. Sometimes he will not come near you for a long time. In that case just get close enough to attract his attention and eventually he will come down. Patience is key here. Remember never to alert the first one. With this strategy you can whittle down the health and eventually kill the second Maneater. Warding is useful, but you have to be careful of when it runs out. The fight is very much doable without Warding & Heavy Armor. Sometimes the entire Warding period may be wasted if he decides to fly away. After one Maneater is dead, the battle is relatively easy. You can either stay near the brazier and fight the other Maneater or bring it closer to the fog. Be careful of the charge attack; you can easily get pushed of the bridge. Works best in soul form. Have Thief's Ring and Cling Ring equipped. Just go through the fog gate and fire at him until it gets right up on you then run to the other side of the bridge. He will have a hard time keeping up with you so you may have to back track and lure him a bit, but keep repeating the process until they are both dead. If you have a good bow it shouldn't take but a few rounds. Using the Lava Bow it's possible to kill the first one before the second shows up. Take out the first Maneater using the above-mentioned exploit (by shooting it with arrows through the fog door). Once you've passed through the boss fog, head to the middle of the walkway. Lure the remaining demon to the ground and keep the brazier between you and it. From here, you should be able to whittle away at his health in sniper mode (by pressing L1 while the bow is equipped) without it ever moving from this spot or presenting any danger to you. Use Firestorm with damage bonuses like Ring of Magical Sharpness, Kris Blade, Hyper Mode (30% health andClever Rat's Ring and/or Morion Blade), Insanity Catalyst, and Monk's Head Collar. The first one will die in about one hit, two if it doesn't get the full brunt of the fire, leaving you alone with the second one: use the same strategy. The brazier is still helpful but remember it will also shield Maneater from your spell. Bring with you a few Old Spice. I find this strategy quick and easy. Note: Beware that the lunge can and will hit you from outside firestorm's range, most spellcasters can be in serious trouble if hit by his lunge. This method works well as long as you are prepared to dodge Maneater when he lunges. If the above strategies don't work for you or recasting Poison Cloud is causing problems, try this: Equip Thief's Ring. First, sprint to the center brazier. Cast Poison Cloud. After he attacks you or flies up, sprint to the other side (opposite where you came in) to the fog. It should give up on you and start moving towards the entrance, but if not, go back to the torch and try again. Now, the spot you want to stay at is between the two broken pillars to the left (if viewed from the entrance side). There's the fog, then a very short pillar "stump," then a higher pillar "stump." Camp out between these and wait. This strategy is super easy. Equip the Thief's Ring and enter the fog. Run past the 1st maneater (#1) but do not go up the stairs! There is a small ledge to the right of the stairs that has a treasure corpse on it. Go and wait by the corpse and the first maneater will lose track of you and stand facing the fog door (back to you) close to the base of the steps. Approach from behind and poison him with Poison Cloud. When the 2nd maneater (#2) makes its entrance roar, go back and wait by the corpse. Wait till you stop hearing #2 fly around. This means he has lost you and you can continue poisoning #1. Once #1 is dead, find #2 near the other fog door with his back facing you. Walk up and poison him with Poison Cloud. Continue poisoning until dead (or firestorm him if you prefer). Don't forget to take advantage of using Soul Thirst and all increased souls equipment. This miracle works great facing Maneater, although keep in mind miracles take a while to activate and God's Wrath costs 100MP per cast. If you run up to the brazier and use it as a shield you will be able to use the miracle while protected and because this miracle has a range of the whole brazier and is able to go through obstacles it exposes both Maneaters to damage. Obviously, this works best if the player has a high Faith level. If you're having difficulty killing them both using spells, use Warding and a Moon or Cresent weapon combined with some careful rolling to make short work of them. Larger weapons can hit both the creature and its snake-like tail simultaneous, effectively killing two birds with one stone. Single-hand pound. Damage varies depending on where the fist hits your character, i.e. less if caught at the outer edges, while maximum damage and knocked down if directly under the attack. Double-handed pound. Much like the previous attack. Only shields with the highest Guard Break Reduction can fully block this attack. Pounce. The Maneater lowers to all fours and pounces at the player character. This attack is unblockable by all but the most resilient shields and knocks the target down or staggers them if blocked. If the Maneater lands in the air, it will proceed to fly. Sonic Wave. The Demon unleashes a sonic wave attack. The wave will travel only as far as the target's last location, hence can be easily avoided by a back-step. The Sonic Wave is a Magical attack. Power Boost. The snake tail bites the back of the neck of the Maneater. The Demon will be immobilized for several seconds, thus allowing this boost to be interrupted. If not interrupted, the upper body of the Demon will glow yellow, signaling a significant increase in damage. This boosts lasts for approximately 30 seconds. Homing Soul Arrows (variant). If the snake tail is intact, it can fire three green soul arrows that will home in towards a target. Fortunately the homing capabilities of this attack is very limited. The boss fight begins with one Maneater lumbering towards you on the narrow walkway. A second Maneater will enter the fight when the first Maneater's health is lowered to 20%, or when 100 seconds have passed since the battle started. Each Maneater consists of two parts: the main body and the snake tail, each representing a different lock-on target. Repeatedly attacking the snake tail will cut it off permanently, and will prevent him from using his Power Boost and Homing Soul Arrows. Even though Maneaters are not quite difficult the first time around, they are among the hardest bosses in the game on New Game +. If you can't progress from there, try using the 'Fog Gate Strategy'. You can kill the first Maneater before entering the fog. Position yourself on the far right or left of the fog gate, zoom in with a bow, and you'll see the first Maneater standing in the center of the walkway. Fire arrows using the best bow at your disposal until the first Maneater dies. At this range, Light Arrows are a good choice. Do not use a Lava Bow. It causes Maneater to stumble backwards out of range. To make this process a little less tedious, use Hyper Mode to increase your damage. Use the stairs leading up to the boss room to inflict fall damage on yourself until you have less than 30% health, then equip the Clever Rat's Ringand Morion Blade (if you have it) to inflict maximum damage. Just don't forget to heal up before stepping through the fog. When equipped with the Thief's Ring or using Cloak, the Maneater can lose track of you and end up going into a loop of flying, landing and taking off again. In the worst case scenario, he will disappear. Additionally, if you strike the Maneater while he is using his power boost such that he falls off the edge, this may also cause him to disappear. Another funny little glitch that can work to your great advantage is that he'll fly just above your head and use his snake-tail to spit out soul arrows, or whatever they are supposed to be. This means you can hit him very easily with a high vertical slash and ultimately kill him without being hit once. It works as long as he's hovering above you. If you can spot it, try firing arrows at it. When hit, it should be alerted to your presence and return to the fight. Load the game via the menu. Unfortunately this will cause the fight to start over. Any items used during the fight will not be replenished.